What in the heck is Warner Brothers thinking? 1. DC, you aren't MARVEL. Marvel is owned by Disney, including Marvel Studios, which is in charge of all the Marvel heroes [except for Spider-Man, X-Men, and the Fantastic Four]. Marvel recently announced its film plans for the next several years, but only AFTER (count them) 10 successful films: Iron Man 1, 2, 3, Thor 1 and 2, Captain America 1 and 2, Hulk, Avengers, and Guardians of the Galaxy. Up until then, they were announcing 2-3 upcoming films at a time. DC hasn't proven anything yet. They have Man of Steel and a Green Lantern FLOP (which is why they're rebooting his film in 6 years!) Why are they so intent on jumping the gun and copying Marvel? But that's not all you're copying, is it, DC/WB? 2. DC, you haven't learned from Sony, have you? Sony owns the film rights to Spider-Man (which is why Spidey hasn't appeared in an "Avengers" film ... yet. But Sony has completely effed up Spider-Man. Describing this would take a whole post, but suffice it to say, the reboot of Spidey hasn't gone well. So poorly, in fact, that they don't plan to release Spidey 3 until at least 2018! In the meantime, what does Sony want to do with its Spider-Man properties? Make VILLAIN movies! Movies no one wants to see: Sinister Six and Venom/Carnage? WITHOUT SPIDER-MAN? No one cares about that, yet here is WB wanting to roll out a Suicide Squad film, when no one except comic book nerds even know what the crap the Suicide Squad is! 4. Casting choices? WTF!?!?! Ezra Miller as Barry Allen [The Flash]? 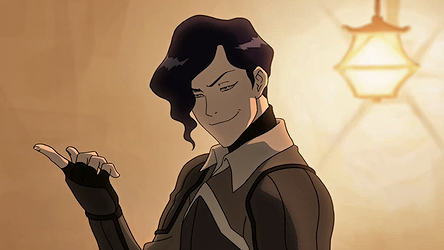 Not only is he the creepiest actor alive, but he looks EXACTLY like Legend of Korra's Tahno, leader of the Wolfbats. Gal Gadot as Wonder Woman was a headscratcher. Ben Affleck as Batman is a wait-and-see pick. But this...? I think DC/WB is setting itself up for total failure. I hope I'm wrong because seeing so many superhero films has been a lot of fun. Marvel is successful. Nobody (not Sony, not WB) understands why. Comic fans all know why (because they understand and are true to the characters and stories; they respect the source material). The investors and executives don't get it, though. The executives and investors look at Marvel and they are jealous. They say, "They have a long-term plan. They have a comic universe. We need that." So they mandate it. Some of the movies will be fine, others won't be. They'll all make money overall but won't be as good as Marvel's cinematic universe because the people making the decisions don't understand why Marvel is succeeding. Marvel is succeeding because their investors gave the right creative people some free rein. WB and Sony aren't ever going to do that. They'll micromanage everything, obsess over star power and which celebrities are cast in which movie, and they'll make schlock. It will make a profit but it will be a disappointment to people who care, and the executives won't care about the people who care. I know this has nothing to do with you current post but I must tell you that I absolutely loved your book, a tale of light and shadow and I cannot wait for more! My mother-in-law got me your book for my birthday and I devoured it in a weeks time. I also am writing a novel and I am encouraged by your accomplishments to keep pushing forward. Can't wait for tales 2 and how this story plays out.